Blog > Issues > Property Rights > This monkey got his day in court. Property owners still can’t. This monkey got his day in court. Property owners still can’t. Why should a monkey receive more protection from the federal courts than a property owner? Robert Thomas of inversecondemnation.com asks that question in a poignant and humorous friend of the court brief filed with the Supreme Court of the United States in support of PLF client, Rose Mary Knick. A bit of background is necessary. In 2011, nature photographer David Slater set up camera equipment for a group of wild crested macaques to take selfies. 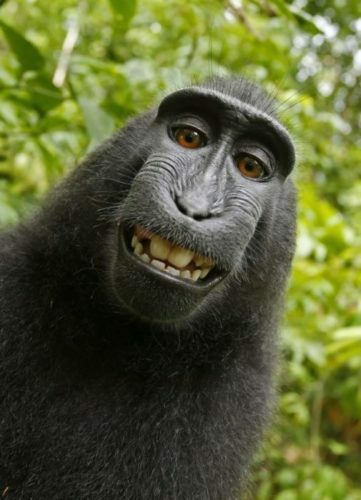 That’s when a macaque known as Naruto took a now infamous selfie. The photo went viral and wound up on the Wikimedia Commons website, which had designated it as a public domain image. Slater objected that he owned the copyright, but Wikimedia refused to remove the image reasoning that because the monkey was the photographer, the photo could not be copyrighted. Just as that dispute drew to a final stalemate, PETA decided to sue Slater on behalf of Naruto for publishing a photography book that included the monkey selfie. PETA asked the court to recognize the monkey’s rights in the photo (and to appoint PETA to administer all proceeds from the photograph to advance its activities). A trial court dismissed the monkey’s case, and PETA appealed to the Ninth Circuit Court of Appeals. Although the Ninth Circuit ultimately dismissed Naruto’s lawsuit, the court held that Naruto did have standing to sue humans for damages. Although a monkey has access to the federal courts, a property owner often does not. That is because property rights are the only rights guaranteed by the United States Constitution that are not directly enforceable by federal courts. This is the result of the U.S. Supreme Court’s 1985 decision in Williamson County Regional Planning Commission v. Hamilton Bank. There, the Court concluded that a property owner alleging that a state entity took his property must first seek just compensation in state courts before his federal constitutional claim will “ripen,” thus being ready for review by federal courts. Worse still, in some jurisdictions, filing a Fifth Amendment takings claim in a state court allows the defendant (the state) to remove the case to federal court only to have it immediately dismissed as unripe. In those jurisdictions, the property owner is denied access to both federal and state court leaving him with no remedy for a constitutional violation. Thankfully, the Court has agreed to reconsider the state litigation requirement when it hears arguments in Knick v. Scott Township on October 3, 2018.